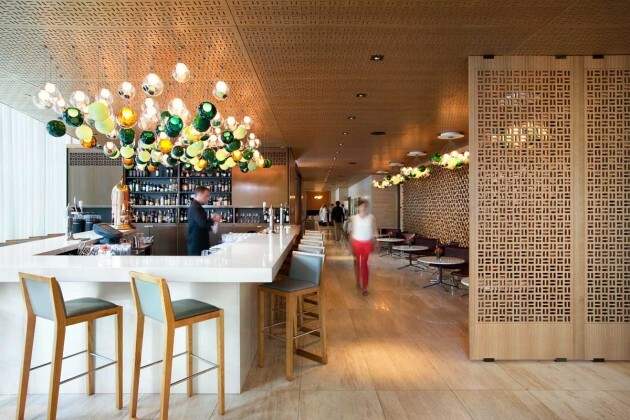 Originally commenced by mcfarlane green bigger and completed by omb | office of mcfarlane biggar architects + designers, the bosk restaurant lies at the base of the Shangri-La Hotel in Toronto, Canada. 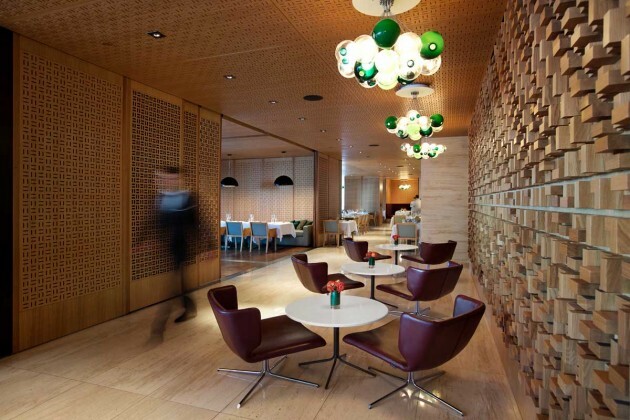 The bosk restaurant in the base of Toronto’s Shangri-La Hotel was conceived as a luxurious and elegant space to complement the hotel lobby while also establishing its own identity as the hotel restaurant and bar. Its design expresses the Shangri-La’s timeless and understated aesthetic and its subtle Asianinspired theme. 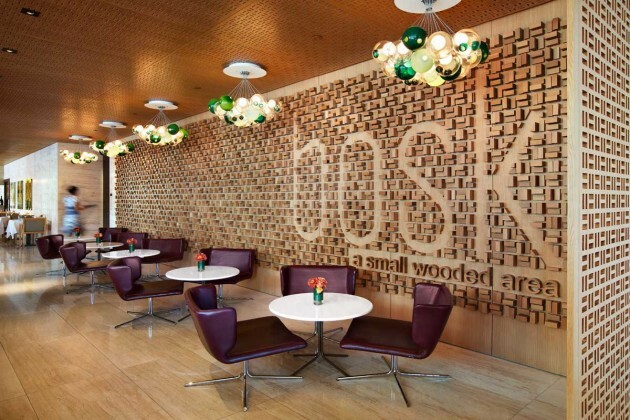 The project’s scope extended beyond the interior design to also include bosk’s branding and graphics, as well as custom furniture and commissioned art selection. 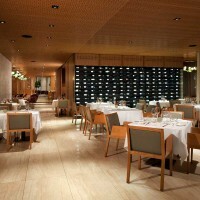 The designers conceived ‘bosk’, meaning ‘a small wooded area’, as the restaurant name to establish the design direction. 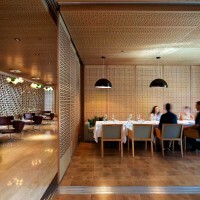 Their conceptual interpretation of the theme is manifested by the oak panels and screens that envelope the space, ensuring a harmonious aesthetic throughout. The panels and sliders define dining, lounge and bar areas, offering flexibility in the room configurations. Each panel features a repeated graphic pattern used in an array of forms – embossed, impressed and perforated,highlighting the remarkable and transformative qualities of the space. 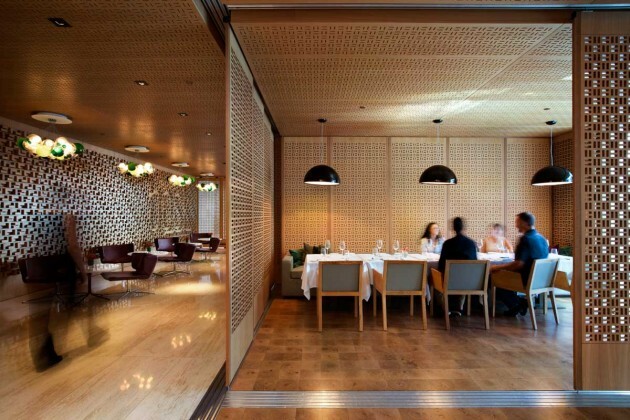 Perforated panels create translucent screens to give privacy while also filtering light. 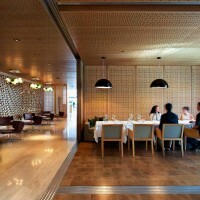 Impressed ceiling panels add texture while hiding mechanical and electrical features. An embossed feature wall in the lounge explodes the pattern in extreme relief. The density of the wood is complemented by cream travertine walls and floors, white solid surfaces, bronze detailing, and tones of warm taupes and deep purples in the furniture. A sea of hand-blown glass pendant lights in varying shades of green and amber, and commissioned large-scale photographs of local forest areas, bring the interior to life. 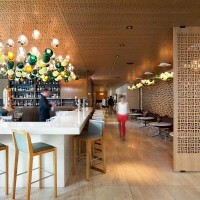 Some of bosk’s palette is shared with the hotel lobby to establish the continuity required as the hotel restaurant. 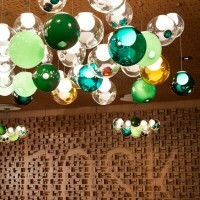 However the proportions and applications of the materials were adjusted to allow bosk to also maintain its own brand. 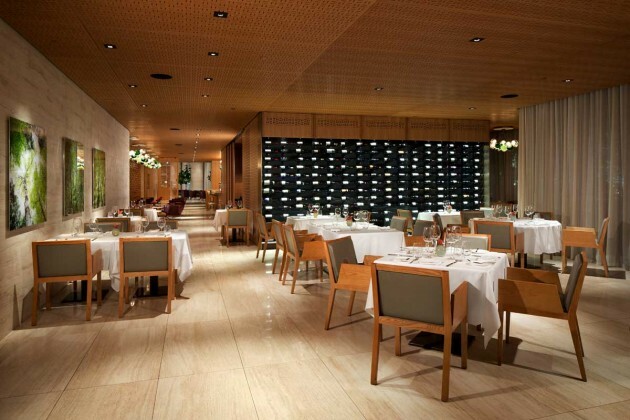 While the lobby heavily features the travertine stone on all surfaces with only accents of the oak wood, bosk uses the wood to define the restaurant with a dramatic and dense application. 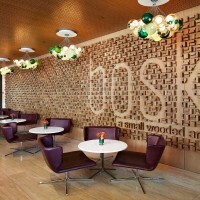 The restaurant bar was positioned at the entry to bosk to service both the lobby and the restaurant and adjacent to the full height glazing to display animated views of the interior to the street. As the restaurant is open from breakfast through to dinner there was a desire to downplay the bar during the morning sittings.